"The End of Politicians: Time for a Real Democracy"
"Powerfully argued and carefully researched"
"An energy drink for social action"
"A powerful critique and provocative alternative"
"A glimpse of what's already changing and what lies on - or just beyond - the horizon of democratic political reform"
Our politics is broken, but it can be fixed. A real democracy is not only possible — it is an urgent necessity. 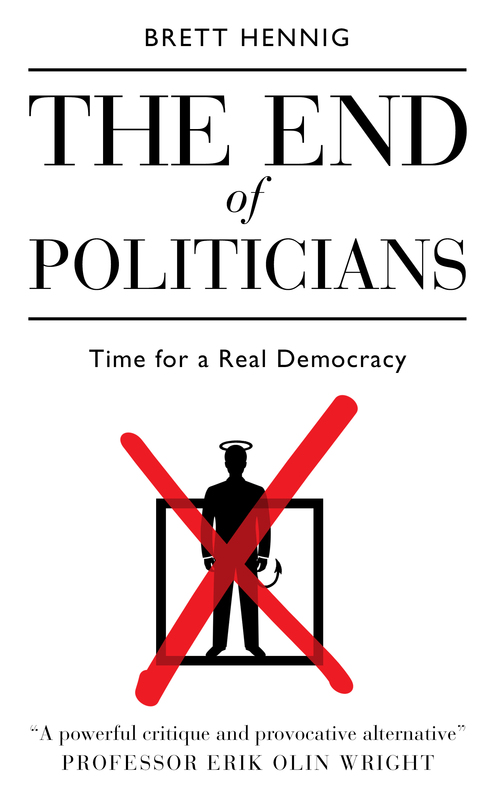 Provocative, succinct and inspiring, The End of Politicians combines insights from the history of democracy with a critical understanding of the information revolution to explain how we can fix democracy by eliminating politicians and replacing them with a representative network of everyday citizens. A wealth of recent evidence has shown that groups of randomly selected, ordinary people can and do make balanced, informed and trusted decisions. These citizens' assemblies are legitimate, accountable, competent and, above all, convincing demonstrations that we can govern ourselves. The future of democracy has arrived. It is time for the end of politicians. Politics as we know it today is evidently broken. In "The End of Politicians" Brett Hennig uses startling research to point towards the solutions and who the great politicians of the future may be. You will probably be surprised to know, that's you! Essential analysis put together in a remarkably accessible way. A book for visionaries. Electoral democracy isn't a real, 'one person - one vote' democracy; we the people don't actually rule. Let's go with Brett Hennig - let's institute sortition to select our legislatures: not as a panacea, but as an essential step on the road to real democracy.